Many of my readers know that our family has been fruit infusing water for some time now. Our new love is infusing tea and lemonade. Yummy! My favorite in the fall is infusing Apple, cinnamon stick and tea. My all time favorite summer infused tea is peach or raspberry tea mixed with the opposite fruit. 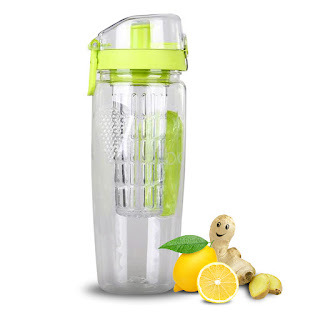 This bottle is one of my favorite infuser bottles it is almost perfect. I have my favorite water bottle which keeps my drinks cold for days even in the hot sun, now I have my favorite so far water infuser. So easy to use, put together, and clean. Love it. You can find the FruitFuzer on Amazon. What FruitFuzer has to say about their product. #1 Fruit Infuser Water Bottle - A Top-Rated Infusion Sports Bottle - Large 32oz Detox Bottle - Leak-proof - Flip Top Lid - Made with Strong Tritan Material, BPA-free - New, stylish, effective, convenient for fruit, tea, herb infusion & good health! 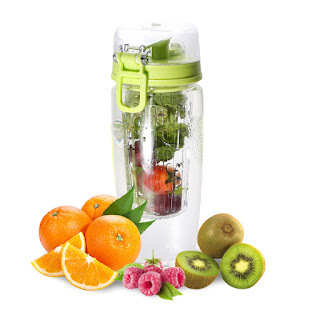 ★ LIVE HEALTHIER - Flavor your water naturally. Get the hydration your body needs. Infuse & add your favorite fruits, vegetable, herbs & teas, recipes and flavor ideas. Infuse your body with Vitamins & Minerals - Naturally. ★ NEW, PERFECT DESIGN - Easy to handle. It has convenient, carry handle and Special fitted Neoprene-grip on both sides for more comfortable, relaxed and secure handling. 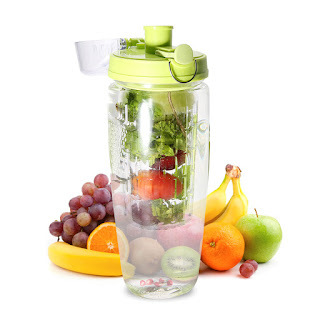 Its large capacity reduces refilling needs so you can more easily drink the water you need. ★ DESIGNED FOR INFUSING - Well-designed & easy to use - It holds the perfect balance of fruit and water - It fits most car cup holders - Lid is Leak-Proof & Lockable - & it is Easy To Clean. ★ STRONG, SAFE; 100% BPA-FREE - Made of premium Eastman Tritan Copolyester Material. Durable & Shatter-Proof - Safe; FDA approved material. ★ WARRANTY - Buy Now With Confidence - Purchase is Risk-Free. We are confident in the design & quality of our bottles - FREE RECIPE e-BOOK: Infuse for a healthier & tastier lifestyle. Your purchases comes with an insert and card to claim your free recipe eBook. Stay healthy & vibrant. Disclosure: MarksvilleandMe received one or more of the products mentioned above as part of a promotion with Tomoson and FruitFuzer. Regardless, MarksvilleandMe only recommends products or services we use personally and believe will be good for our readers. Some of the links in the article may be “affiliate links.” This means if you click on the link and purchase the item, I will receive compensation. If you would like MarksvilleandMe to review a product or service please contact us at marksvilleandme@gmail.com.